I rarely leave home without a small loom. If I am the passenger in a car, I weave. If I have to wait for an appointment, I weave. When in an airport or flying…. I weave. If I am sitting, listening to my husband’s Jazz trio/quartette/quintette, I weave. I like to be able to to port along my small looms in tote bags, backpacks or baskets. But…. the warp strands and bobbins and needles can get seriously disarranged by being jostled in transit. I have been mulling over the best way of protecting them while they are being trundled about…. and then it struck me…. 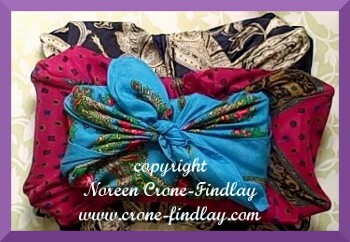 I always carry headscarves in my purse or bag, to use as instant tote bags. The other day, it struck me that the perfect way to protect my beloved small looms when I am slipping them into bags or baskets for their travels, is to ‘Furoshiki’ them. I usually use square headscarves- and any size will work… smaller scarves are great for small looms or bundles of books and tools; larger scarves for larger bundles of looms and stuff. But, you don’t have to use scarves: This is a great upcycling opportunity! The models in the video are my 3 smallest Mirrix looms. I call them the Three Sisters. I love, love LOVE my Three Little Sisters! I have renamed them: The Mini is ‘Molly Whuppie’ (you can read her story in my book, Soul Mate Dolls), ‘Vasilisa’ (heroine of a wonderful Russian fairytale) is the name of the 8 inch loom, and the 12 inch is now known as ‘Jane’, after my beloved Jane Austen.